Google Mobile is becoming one of the best places to get news and information about the rapidly changing mobile phone industry. And the Google Mobile blog has always been one of my favorite places to stop to try to catch up on what’s happening in the mobile phone industry. On Twitter, @GoogleMobile will share announcements, cool uses and product tips for Google products on mobile platforms, behind-the-scenes musings from Googlers and general goings-on in the mobile world. 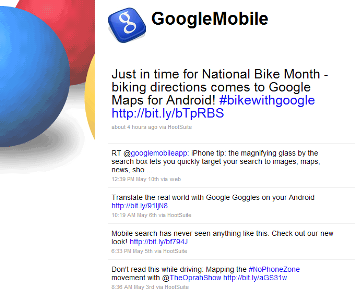 Simply go to twitter.com/googlemobile, sign in (or sign up), and choose “follow”. Google Mobile also now has a Fan Page on Facebook. On this page, you have the freedom to contribute just about anything you want – submit photos and videos, post suggestions and comments on our wall, and strike up discussions with other fans of Google Mobile. A lot of the news and information you get from Google Mobile are updates and features they are adding to their own Nexus One phone, but also to the Google Android operation system. However, there is a separate Android OS blog specifically for that.